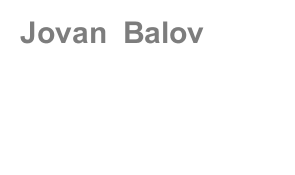 The paintings of Jovan Balov deviate from the principles of America hyper/photo realism in as much that he does not use one photograph to convey the image or emotion of a model. Jovan Balov´s portraits rely on four different photographs that communicate four different emotions. Undetectable by a plain eye, these realistic convey simultaneously four different emotions.